It was a sweet reunion for Gen-X Cops actors Daniel Wu, Stephen Fung, Nicholas Tse and Sam Lee at the Hong Kong Film Awards held on Sunday (April 14). The quartet was invited to present two awards at the ceremony, 20 years after the movie first premiered. Did someone say 20 years? Even Daniel himself expressed disbelief at the time that has flown past. He wrote on Weibo: "Us Gen-X Cops had the opportunity to reunite because we presented two awards at the Hong Kong Film Awards. I can't believe it's been 20 years since the movie! Who wants to see a new version of Gen-X Cops?" The 'Gen-X Cops' reunited to present 2 awards at the ceremony, 20 years later. Actor Daniel Wu, who has made a successful foray into Hollywood in the years since then, wrote on Weibo: Us 'Gen-X Cops' had the opportunity to reunite because we presented two awards at the Hong Kong Film Awards. I can't believe it's been 20 years since the movie! Who wants to see a new version of Gen-X Cops? "I also got to meet my old friend Miriam Yeung, who looked fab! This trip, though rushed, made me miss this place, the things I'd accomplished and the friends I'd made! Hope I can return to this place soon. " Miriam Yeung returned the affection on Weibo, calling Daniel an "old lover" whom she's missed. Malaysian singer-rapper Namewee wrote on Weibo that he's grateful for the opportunity to share the stage with these 'brothers' -- the cast from Young & Dangerous. The actors from Young & Dangerous also performed at the ceremony. Project Gutenberg's Felix Chong won Best Director, ahead of Fruit Chan (Three Husbands), Dante Lam (Operation Red Sea), Sunny Chan (Men On The Dragon) and Oliver Chan (Still Human). In the years since then, the 44-year-old American-Chinese actor has made a successful foray into Hollywood with roles in movies and the recently-cancelled martial arts TV series, Into the Badlands, which he also produced. Former actor Stephen Fung, 44, has also moved behind the lens as producer and director, while reformed bad boy Nicholas Tse, 38, has in recent years carved a name for himself as a TV chef. Daniel also showed some love to his former co-star, Miriam Yeung, and to Hong Kong in general. "I got to meet my old friend Miriam Yeung, who looked fab! This trip, though rushed, made me miss this place, the things I'd accomplished and the friends I'd made! Hope I can return soon," wrote Daniel. The actress returned the affection, calling Daniel an "old lover" whom she's missed. Another reunion which took centrestage was the cast of iconic '90s triad movie Young and Dangerous, who performed at the event. Malaysian rapper-singer Namewee posted a backstage photo taken together with Ekin Cheng, Jerry Lamb, Jordan Chan, Michael Tse and Chin Ka Lok, and expressed his gratitude for the opportunity to share the stage with these 'brothers'. 打完收工! #古惑佬大合照 多謝香港電影金像獎的邀請讓我有機會同洪興的揸fit人同埋兄弟一齊唱歌。Thx 香港電影金像獎 Hong Kong Film Awards! We all grow up with HK movie! The awards on Sunday saw veteran actor Anthony Wong beating out Chow Yun Fat for the Best Actor accolade. Project Gutenberg, which came into the competition with 17 nominations, bagged two top prizes -- Best Director for Felix Chong, as well as Best Movie. 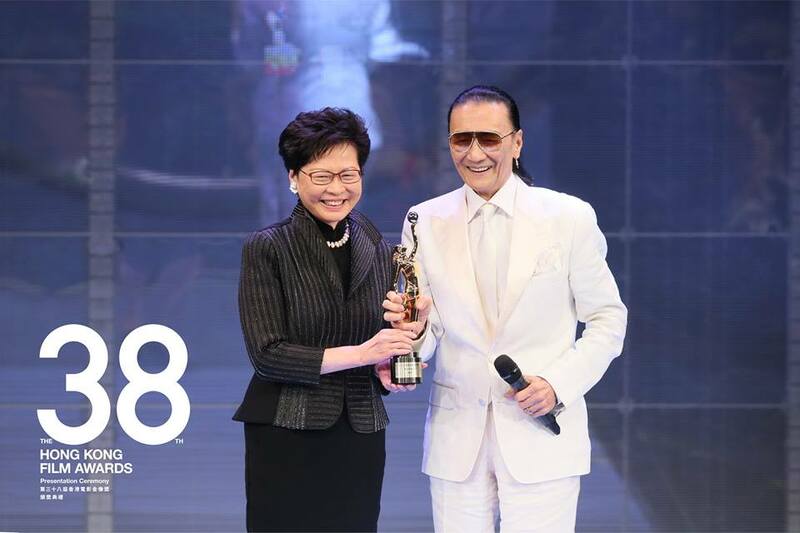 Nicholas' father, Patrick Tse, 82, was presented with the Lifetime Achievement Award.